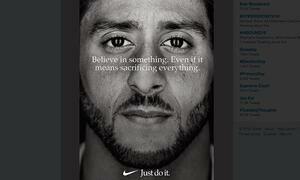 Nike stoked controversy this week with a new advertisement in the company’s ongoing “Just Do It” campaign featuring Colin Kaepernick, the NFL football player who in 2016 chose not to stand for the playing of the national anthem to protest racial injustice. The ad is a gutsy move by Nike because of the controversy surrounding Kaepernick. During a post-game interview during a 2016 preseason game, Kaepernick explained his actions: "I am not going to stand up to show pride in a flag for a country that oppresses black people and people of color. To me, this is bigger than football and it would be selfish on my part to look the other way. There are bodies in the street and people getting paid leave and getting away with murder." Immediately after the 2016 moves, Kaepernick’s shirt became the top seller on the NFL website. At the same time, many people jumped onto social media to voice objections to what they saw as an unpatriotic move. There is always risk when a company wades into politics or takes controversial positions. Indeed the company’s shares have fallen today in response. Yet a move such Nike using Kaepernick is bold and brash. It generates a great deal of attention and means that those who agree with his stance are much more likely to continue to do business with the company. But people are vocal in opposition. The hashtag #NikeBoycott is trending. People are lighting Nike shoes on fire. Generally, I suggest that companies be very careful about wading in with what can be seen as controversial positions on social issues. However, in a world where so much is increasingly polarizing, staking a claim like Nike has done shows what an organization stands for. It’s memorable. It’s gutsy. Ultimately, customers choose with the wallets.